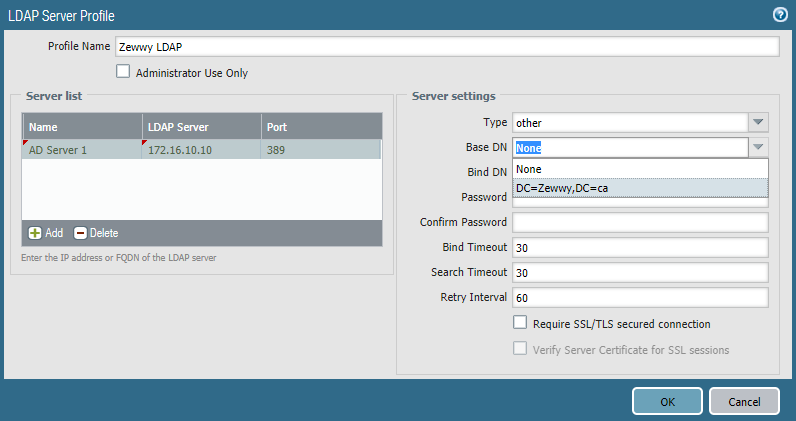 I’d figure I’d spin up a really quick guide on setting up client type VPN using Palo Alto Firewalls. In this case it will use GlobalProtect, so will require appropriate licenses to work. I won’t exactly cover the license aspect in my blog as I find that stuff a bore, and can leave that for the good ol’ VARs to handle. Anyway let’s get into this. 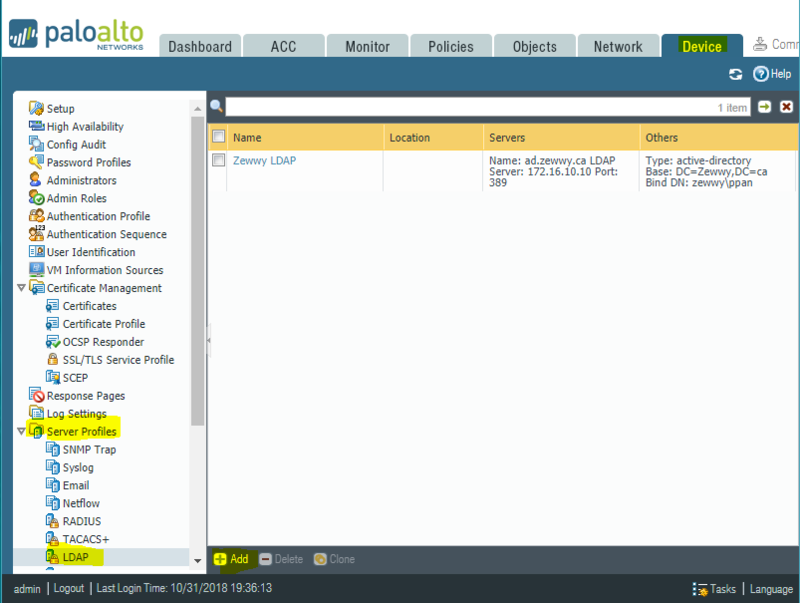 So to start on the Palo Alto (My Examples utilize PAN OS 7.1.x, however, 5-6, as well as 8 are very similar) Web interface go to Device -> Server Profiles -> LDAP then click add. Give the Profile a meaningful name, then click on the add button under server list. 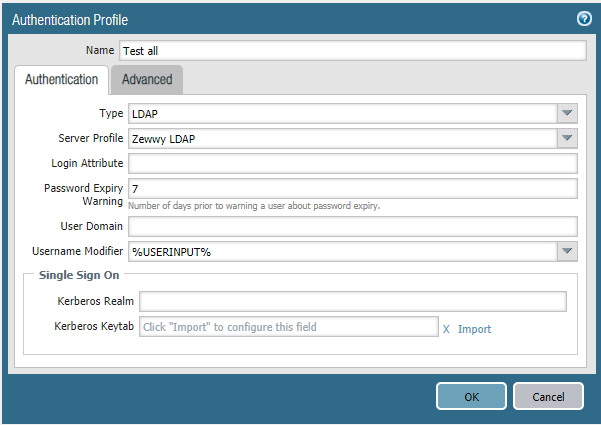 Since I didn’t have LDAPS setup, I had no cert to use, so I had to uncheck “Require SSL/TLS secured connection” only then would the Base DN auto-populate, verifying that my LDAP connection was indeed successful. 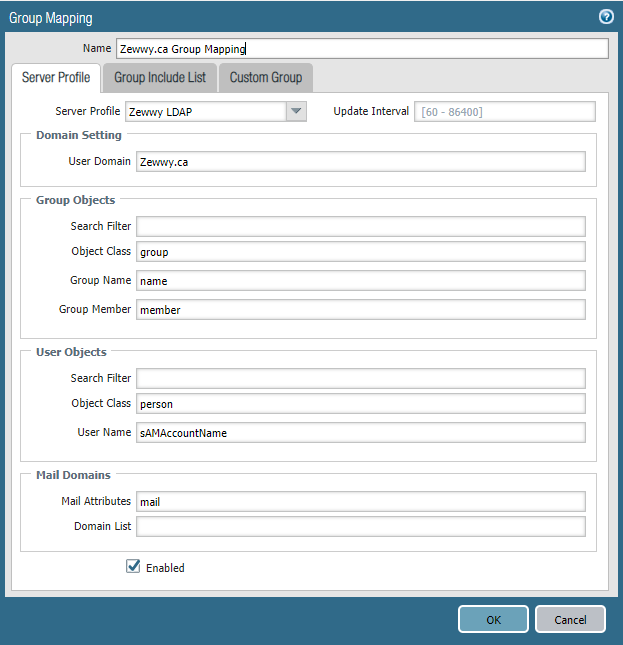 Also note in my lab I had a separate NIC dedicated to my domain, which was separate from the usual home network, thus I had to setup a “Service Routes” for LDAP specifically. I decided to also create a standard domain account and use it for the Bind DN. This may or may not be required. Now this is where things get a little weird…. 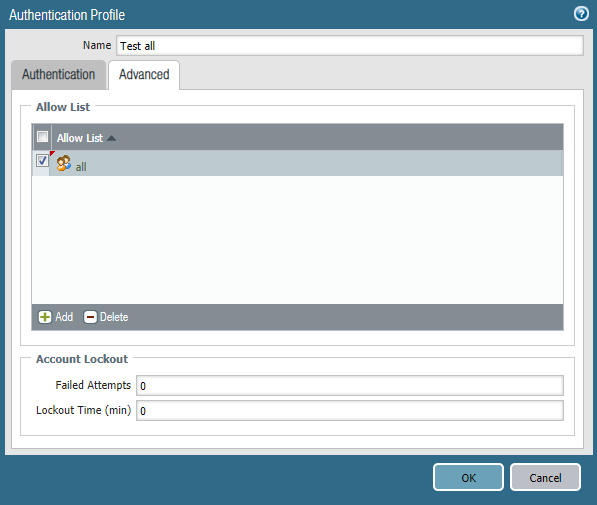 According to step 2 from this Palo Alto post you setup the authentication profile. 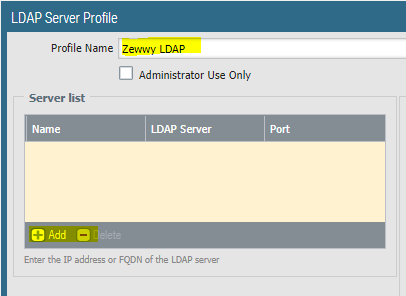 So nothing special, select LDAP, selected my LDAP Server Profile, then click the next tab is it is required “Advanced” tab. So in my first case I decided to use my “domain users” as my filter group, as it’s pretty common group and I don’t have many users in it. Simple, so now we have all the basics to now test it. What the heck?!?! I swear everything was correct, I also knew I was entering my password correctly and everything. No matter how you change the settings in the Auth Profile nothing works (I double and triple checked proper group membership in AD, and ensured the firewall could see it all “show user group” and “show user group name “CN=domain users,OU=users,DC=zewwy,DC=ca””) until I noticed from the link in this steps title that his simple test was using that “all” group that is used when there is no group mapping defined, or just simple at the top of the list. 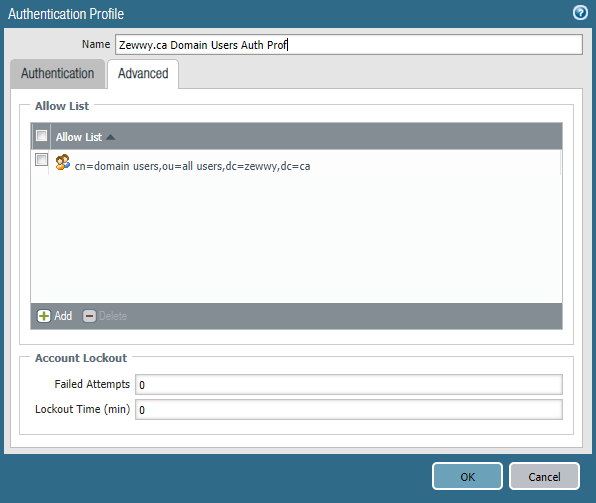 So creating a new Authentication Profile not specifying my AD group..
And that concludes the Authentication part well at least the dependency, in part 2 I’ll cover the certificates requirements. I currently have a ticket open with Palo ALto as to why the “Allow List” section of the Authentication Profile doesn’t pick up the users in which should be in those account as shown by the “show user group name “CN group name”, so if this commands shows users based on a group, the allow list should be able to validate that as well. *UPDATE* According to PAN support the Test Authentication *BUG* although he didn’t want to admit it as a bug is claimed to be fixed in PAN OS 8.1.3. I have yet to upgrade some units to this version and verify that claim.